They are believed to have evolved from a putative common ancestor of the gram-positive bacteria by a process of genome reduction and adoption of a dependent, parasitic life style. 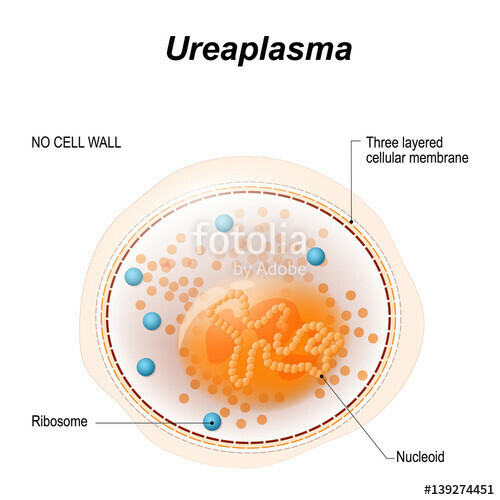 Mycoplasma and Ureaplasma spp. lack a cell wall. Therefore, they cannot be visualized with the Gram stain and are not susceptible to antibiotics that act on cell wall synthesis (eg, penicillins and cephalosporins). They are capable of growing in cell-free media, but require many exogenous nutrients for growth, including sterols. In addition to Ureaplasma urealyticum, 13 species of Mycoplasma have been isolated from humans; however, most of them are not regarded as pathogens. Mycoplasmas are the etiologic agents and cofactors of several clinical syndromes in humans. Mycoplasma pneumoniae is a common cause of community-acquired pneumonia. U urealyticum and Mycoplasma genitalium most often cause genitourinary tract infections; U urealyticum has also been associated with perinatal morbidity and mortality, as well as with disease outside the genitourinary tract, especially in children. Mycoplasma hominis is an infrequent cause of bone, joint, and upper urinary tract disease. U urealyticum, M hominis, and M genitalium are commensals of the genitourinary tract of both women and men and in newborns. U urealyticum is an infrequent cause of urethritis in males, urinary calculi, chorioamnionitis, spontaneous abortion, and premature birth. M genitalium is also associated with male urethritis. M hominis is a rare cause of pyelonephritis, pelvic inflammatory disease, and postabortal and postpartum fevers. U urealyticum and M hominis can cause disease outside the genitourinary tract in immunosuppressed patients or in otherwise immunocompetent patients after manipulation or trauma of the genitourinary tract. M hominis can cause sternal wound infections and osteomyelitis, arthritis (especially in hypogammaglobulinemic patients), brain abscess, pneumonia, and peritonitis. It has been associated with neonatal pneumonia and sepsis. In immunosuppressed patients, U urealyticum can cause arthritis, osteomyelitis, sinusitis, and pneumonia. It can also cause neonatal pneumonia and sepsis. A thorough search for other causes should be completed before U urealyticum or M hominis can be considered the etiologic agent of any of the above syndromes. Mycoplasma penetrans, Mycoplasma pirum, and Mycoplasma fermentans have been associated with HIV infection and with the progression to AIDS; however, there is little evidence for a causal role of these organisms in this disease process. The associations more likely reflect the enhanced susceptibility of the HIV-infected host to secondary mycoplasma infection. M hominis can be treated with tetracyclines or with clindamycin. U urealyticum infections can be treated with tetracyclines, erythromycin, or azithromycin. Both U urealyticum and M hominis can be resistant to the tetracyclines. M hominis is resistant to the macrolides. Cell wall antibiotics have no role in the treatment of mycoplasma infections. IV clarithromycin is not available.